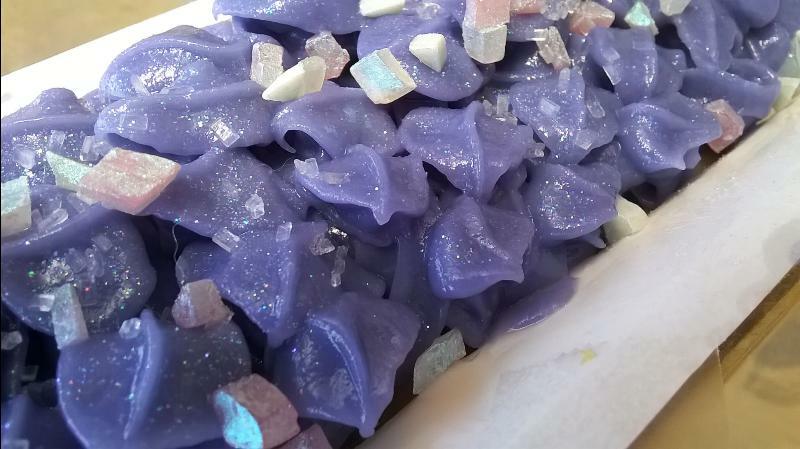 I was invited to be a participant in an international soap makers group and exchange this past spring. It is thrilling when a group of artistic people ask you to be involved in their project! To meet and visit and share ideas on line is one of the wonders of the internet world, making the world a smaller and friendlier place. It's been a real pleasure. My intention was to make one lovely soap for this project and stamp it with a new logo stamp. I enjoy using the wooden logo stamps that I get from Spain and needed a new one. Well as time went by I had the logo designed and was ready to order I somehow set it in abeyance and it got lost in the shuffle ;( We know how that happens from time to time! As time went along I kept making this and that soap not knowing which to send along for the project. In the end I sent 2 of this and 3 of that all packaged according to whim. The last of my soap project went off to Europe a mere week ago and my beautiful stamp arrived today! Many thanks to Omar Lopez of PasitoaPasito blog for another wonderful logo stamp! Now that this beautiful stamp is here well the soaps are a little more cured than one would like to use for the stamping procedure. However where there is a will there is a way! I planed a sliver, shaved a thin piece of soap off of two recently made bars and then worked some stamp magic on them. Just exposing that minute amount of the 2 week old soap was enough to let the stamp set the logo into the bar! Who knew? It worked --- yeah! 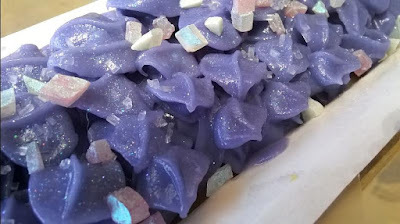 Here it is used on a dark and light colored soap! Omar's soap stamps are professional and beautiful in their simplicity and ease of use. Cleaning the stamp is a breeze. He designs your stamp following your illustration/instructions and tweeks the design so that it is suitable for a soap stamp! His work is precision, the project and shipping timeline are very reasonable and he sends the stamp with care and cleaning instructions. I'm thrilled to share these photos with you and hope you will drop him a line if you need a logo soap stamp. Here is my logo that Omar worked off of and simplified for the stamp. Oh it has been too long since my last post. I wanted to share what I've been up to. This soap is a test soap of my new soaping recipe. I'm preparing for a festival the end of July so it has been busy here. The Mother's Day Spring Bloom event at Lucero Olive Oils was such fun. we were invited to do Berry Festival and a festival for Labor Day Holidays at Lake Almanor so those berry flavored lip balms and scented soaps and scrubs are a priority thismonth! "aPINK Philosophy" is the name of this soap. It is still in the mold and waiting a few days into the cure before I cut it. The fragrance is a white floral of citrus jasmine rose and musk very delicate and clean. Made with skin loving Avocado and Hemp seed oil with cocoa butter and coconut milk it is finished off with a touch of silk and premium fragrance. We have an elegant bar of luxury soap! Full of lovely velvet lather and fluffy bubbles and leaving the skin feeling clean and pampered. Dusted with a touch of cosmetic glitter it is a sparkler. I hope we get to see you at one of these events this summer! Stay cool.